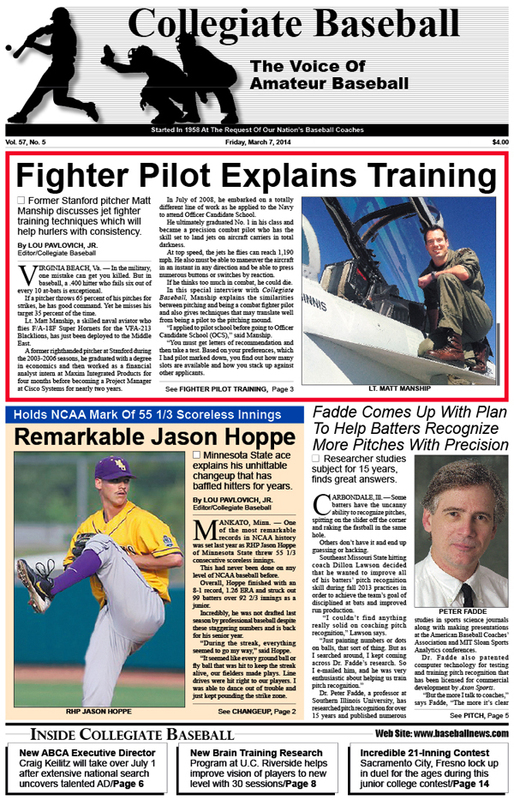 • Former Stanford pitcher Matt Manship, now a skilled fighter pilot for the Navy who was just deployed to the Middle East, explains his precision training which directly correlates to training pitchers. • Minnesota State RHP Jason Hoppe explains his incredible changeup which allowed him to set an NCAA mark of 55 1/3 scoreless innings in 2013. • Dr. Peter Fadde of Southern Illinois University, who has researched pitch recognition for over 15 years, comes up with protocol that will help batters recognize more pitches. • NCAA rules that Oregon State LHP Ben Wetzler must sit out 20 percent of games during 2014 baseball season. • Dr. Bill Harrison, who has tested the athletic vision of thousands of Major League players over the years, says that Barry Bonds was without equal with his vision skills. • Editorial: Administrators must wield power carefully, fairly when dealing with coaches. Trio of college baseball coaches were manhandled over the years by cancers in profession. • Craig Keilitz named new executive director of American Baseball Coaches Association. • National College Baseball Hall Of Fame Names 2014 Inductees, including Demie Mainieri, Gene Stephenson, Bill Bordley, Alex Fernandez, Mike Fiore, Mickey Sullivan and William Matthews. • San Francisco wins wild 19-inning game against Cal. St. Fullerton. Neither team scored for 12 consecutive innings prior to 19th inning as game featured 36 combined strikeouts by pitchers. • NCAA Division 2 Notes: Concord’s Bret Blevins kicks off 2014 season with 5 hits in game. • NCAA Division 1 Notes: Brain training research improves vision at U.C. Riverside as 4.4 percent fewer strikeouts take place. • NCAA Division 3 Notes: Guilford pitchers nearly post back-to-back no-hitters. • Louisville Slugger National Players of The Week features 7 amazing players. • European League seeks talented American baseball players for summer teams. • Fred Hill resigns at Rutgers University after superb 37-year-career and 1,089 victories at collegiate level. • High School Notes: Terrific high school tournaments are scheduled across USA this spring. • Ruleball With Rich Marazzi: Poor vision habits can cause big trouble in games. • College recruiting with Tom Kovic: Navigating this difficult maze can be a challenge. • Instructional clinic with Charlie Greene: Making important adjustments are vital for success. • NAIA Notes: Concordia RHP Keegan Yuhl fires first no-hitter in school history with 12 strikeouts. • Junior College Notes: Unbelievable 21-inning game between Sacramento City and Fresno City Colleges lasts nearly 7 hours as Sacramento ultimately wins, 11-6. • U.C. Irvine’s Mike Gillespie celebrates 1,000th career NCAA Division I victory with 7-2 win over Long Beach St. In addition, other milestone victories are recognized by UAB coach Brian Shoop, Dave Jarvis of Belmont and Baylor skipper Steve Smith.